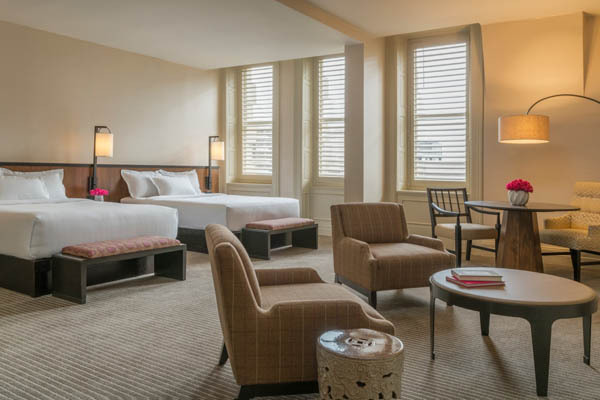 A stay at the Hyatt at The Bellevue in Philadelphia is a step back in time to the Golden Era. Opening its doors in 1904, the Bellevue-Stratford, French Renaissance designed and styled hotel, known as the “Grand Dame of Broad Street”, was built to rival New York City’s luxurious Waldorf-Astoria. Now, after an extensive multi-million renovation, the opulence and elegance of the original structure has been recaptured; the once 1,090 room hotel houses only 172 guest rooms, luxury business offices, upscale restaurants and retailers, spa and salon, and adjacent in the same complex, a Sporting Club. Checking into The Hyatt at The Bellevue was easy, as the friendly staff were most welcoming. Albeit small, the lobby appeared grand, featuring marble columns and floors. Walking through hallways, the rich history of the hotel was felt. Light fixtures by Thomas Edison, stained glass by Tiffany, and chandeliers by Lalique, are appointments that still adorn from its original interior, while the décor of each floor is represented by a different local theater, with all artwork created by the hands of area artists. As a nod to the fashion of the era in which they were built, guest room hallways had been built extra wide to accommodate the grandeur of hoop skirts. 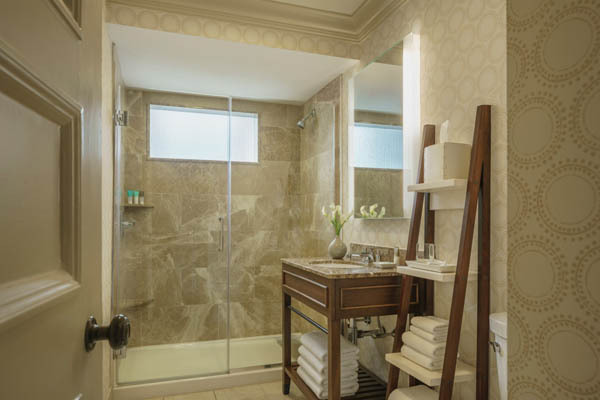 Guest rooms recently underwent additional renovations, each now with the modernity of flat-panel TVs and sleek bathrooms. Beneath the high ceilings that emphasize each room’s spaciousness, furnishings are luxurious and comfortable. The hotel is conveniently located in the heart of Philadelphia, the center of its prestigious historical, cultural, culinary and theater district, the “Avenue of the Arts”. The Hyatt at The Bellevue’s doorman graciously refers guests to notable local restaurants, though culinary delights within the hotel are near-perfection. Breakfast, buffet or a la carte, can be enjoyed in an upstairs dining area, and an evening meal at the fine restaurant, XIX, should not be missed. 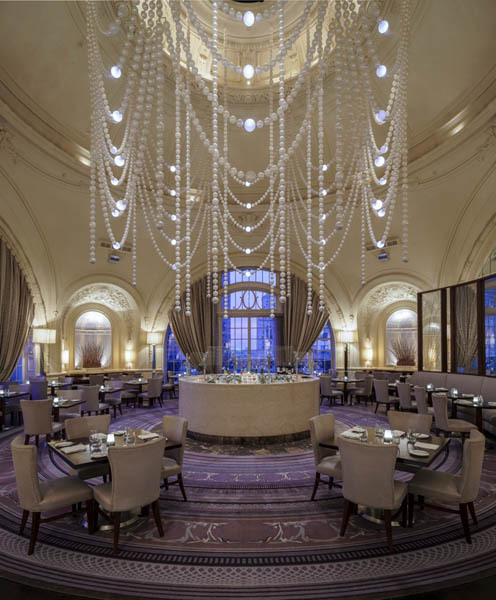 There, pearls drape from the ceiling, views of the city can be taken in, and a generally romantic romantic feeling can easily set in. Our attentive server, Rashid, made excellent recommendations to us: selections from the extensive list of wines; delectable Jumbo Lump Crab Cakes; Shrimp Cocktail; juicy Ribeye Steak; and luscious desserts, including apple cinnamon donuts. The hotel also offers multiple spaces to hold meetings and events. The Grand Ballroom is highlighted by a two-tiered balcony, a full stage, and Philadelphia’s most celebrated marble and hand-worked iron elliptical staircase. Lavish receptions and banquets for up to 1,500 people are regularly held there – including the Academy of Music Ball – and on the 19th Floor, The Rose Garden Ballroom, once a rooftop rose garden by summer and a skating rink by winter, can cater to up to 275 guests. Equally lavish for those who exercise during their stay, is the Sporting Club – a five level, 93,000 square foot athletic facility juxtaposed to the hotel. Complimentary passes for hotel guests allow for the opportunity to utilize any of the more than 150 pieces of exercise equipment, NBA regulation sized basketball court, squash and racquetball courts, indoor golf, 25-meter pool, sauna, steam rooms and whirlpool. 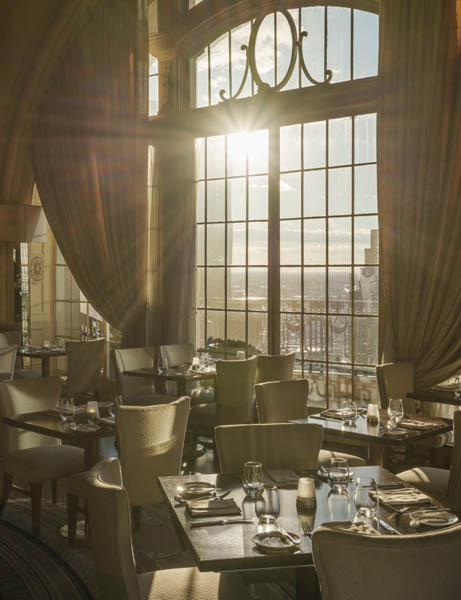 From the time when “The Bellevue-Stratford” was regarded as the see-and-be-seen locale in Philadelphia, it has continued to garner such attention, remaining a vital part of the city’s social, political and business scene. Theodore Roosevelt visited, as has every United States president since, evidencing that what has grown into the Hyatt at The Bellevue, is still a revered landmark. Little wonder that it continues to reign as the “Grand Dame of Broad Street”.